Here is a breakdown of each type of Counting Engine Issue, as a first step it's recommended to determine which type you have. A print job records in Print Manager Plus as more or less pages than actually came out of the printer. PMP adds an extra page when a job is printed duplex. My print job does not record the duplex options I am selecting correctly. This can affect a number of sheets. These help define each item you will see in the reports and how Print Manager Plus counts it. This may need to be referenced to help in troubleshooting such an issue. Indicates whether or not color ink usage has been detected. *Black and white printers will report all jobs as No. *If black & white, or grayscale driver option have been chosen, this will also be no. *Some complex graphics, or specific printers will use color, unless black & white/grayscale mode is selected. One printed page from a document. There may be multiple pages of your document printed on a single sheet of paper if duplex or N-up is selected. One physical piece of paper. This may or may not include multiple “pages” if duplex printing is selected. Indicating if a print job that is printed on both sides of the same sheet of paper. This is the number of times a single document will be repeatedly printed as selected in the copies counter during the print dialogue. This is the total number of pages including copies that a document consists of prior to any breakdown into sheets because of duplex. This is a printing option where multiple pages are printed on each side of the sheet of paper, for example, 4 pages fit onto a single page. Print Manager Plus will track the actual sides of paper used, not the total pages in the document. Print Manager Plus attempts to track what actually occurred, rather than what you may have set. Ensure that you are reviewing exactly what is coming out of the printer, and comparing it to the reported totals. Try using a different driver, for example a PCL driver instead of Postscript, or checking the print driver settings to make sure these options are enabled such as duplexing or color printing. Try printing from a different application or making sure that the application you’re using itself has the option to print in the method specified such as color or page size indicated. If the driver and application seem capable of printing the job the way you want, then contact the printer manufacturer for further assistance with getting the printer to print the way you are setting it to. As support for various printers and applications is updated, Print Manager Plus is updated and newer releases will have all previous fixes and updates included which may fix the issue you are running into. Solution: Update Print Manager to the latest release. b. Under the Server Update section, make sure your server version is updated to the current release. Select your server and then click "Update Selected Servers". This requires you have a current maintenance agreement for your license. c. If eUpdate is not available for some reason, please email worldwidesupport@printmanager.com with your company name and license key and we will provide you with a link to download the latest version so you may update your server. 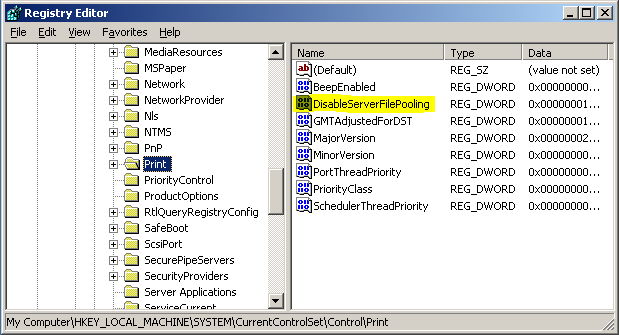 In certain windows installations, File Pooling can cause spool files to become locked and/or unreadable. This can result in incorrect page counts. 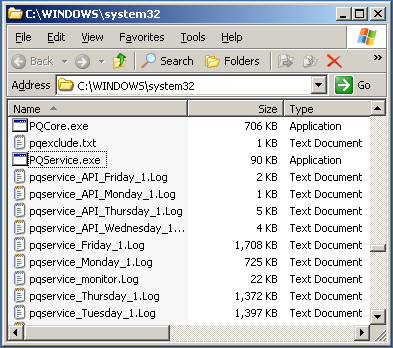 This is evidenced by spool files starting with the letters FP such as FP002.spl and is documented on Microsoft’s Websitehttp://support.microsoft.com/kb/815913. Typically Print Manager Plus will disable file pooling for you, and this will take effect after rebooting. If you have not rebooted since installation, this should be done. d. In the New Value #1 box, type DisableServerFilePooling, and then press ENTER. e. Right-click DisableServerFilePooling, and then click Modify. 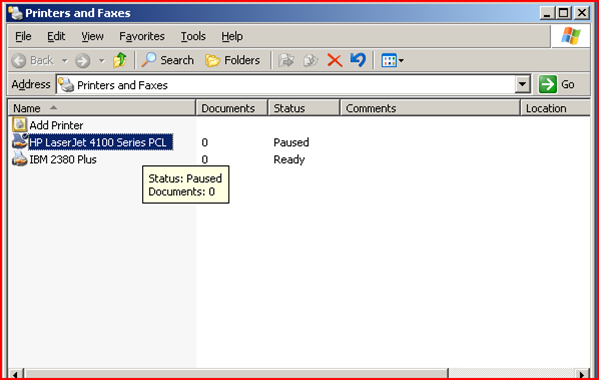 f. In the Value data box, type 1 to turn off spool file pooling, and then click OK.
h. Restart the Print Spooler service. 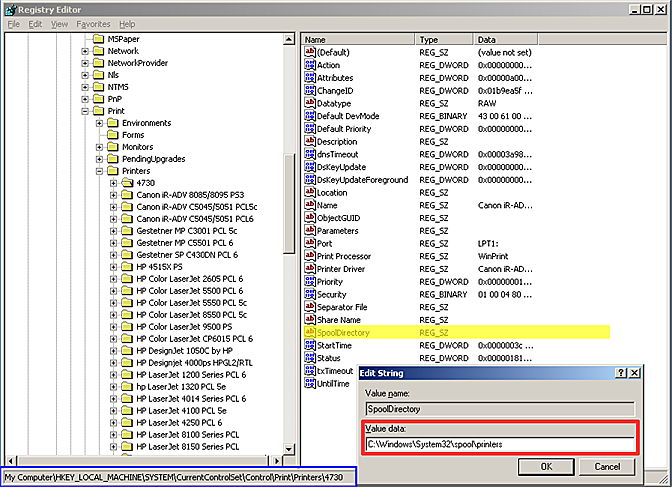 c. In the right pane of the registry, right-click SpoolDirectory, and then click Modify. d. In the Value data box, type the location where you want the spool files to be stored. 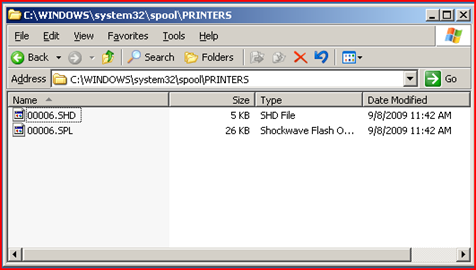 For example, type c:windowssystem32spoolprinters as the default location. f. Restart the Print Spooler service. g. All new jobs will be of the form XXXXX.SPL and XXXXX.SHD and will be numbered consistently with their JobIDs. To resolve issues with miscounting printers we need to receive spool files for both a mis-counting job and a job that tracks correctly so that we may analyze what is being incorrectly tracked. If your issue is with duplex jobs not being marked correctly, then in that case you would provide spool files for a duplex job, and the same job printed non-duplex. For a color or black and white issue, a document of the same type tracking as black and white and color should suffice. 4. send BOTH the SPL and SHD files from this folder. There are 2 files for each job printed, so if 2 jobs are printed there will be a total of 4 files. 8. Un-pause the print queue.